Evgeny Potorochin made a presentation and answered questions. What types of birds can you watch in the region? According to our data, there are over 300 types of birds in the Murmansk Region, which is attractive to many birds, including seabirds, colony-nesting and bazaar birds, forest and semi-aquatic birds. You can see different types of birds depending on the season, some of which are resident birds, while others are migratory birds. You can find this information in our guide book and other sources. There are areas where you can go for recreation and also to see colonies of various types of birds. This is a tourist attraction. The taiga areas have different birds, including owls, hawks and peregrines. There are also unique but difficult to access areas. There are areas where you can watch birds within city limits. For example, you can see many types of migratory birds at the drainage canal in Kandalaksha in the spring. Murmansk and the Kola Bay are good for birdwatching in the fall and winter. You can see Steller's Eider and the ordinary Black-throated Loon there. If you want to see rare passerines or predatory birds, you should go to specially protected areas. In general, 300 types of birds is an impressive number. Ornithologists have not studied the Murmansk Region sufficiently, although active research is underway at the nature reserve. The other areas on the map are difficult to access. I mean the eastern part of the Kola Peninsula. This attracts tourists but also limits their possibilities. We need to find an effective way to govern this process, considering that an increased inflow of tourists must not affect the biota, including ice biota. What is the best season for birdwatching in the Murmansk Region? In my opinion, the best time is spring and summer, when you can see many more types of birds than during other seasons. I am referring to taiga birds, which are difficult to find or watch. The reproduction season ends by the fall, bird activity decreases, and you can no longer see many birds. What is the difference between professional and amateur birdwatchers? The difference is relative. I believe that professionals try to earn money from birdwatching by selling their photographs and the information they collect around the world. There are also twitchers, who try to see as many birds in a given area as possible. And there are people who only look for certain types of birds, and there is no point in offering them anything else, even in unusual conditions. 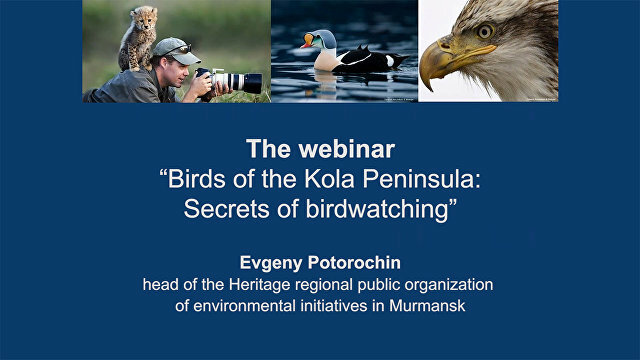 Do the ornithological research organizations working in the Kola Peninsula benefit from birdwatching tourism? Do you plan to develop a connection between them? Some nature reserves are conducting active promotion campaigns, but opinions differ. Some believe that birdwatching is bad for preserving the biota, while others say that birdwatching should be promoted. We have not yet managed to involve them in our work, but we are discussing the issue. We have partners among non-profit nature protection organizations. We believe that birdwatching can be used to stimulate the development of specially protected areas. We are promoting this idea at the regional level, because much is being said in the region about the development of various kinds of tourism. If I'm not mistaken, a booklet on birdwatching will be published soon by the Murmansk regional government. It will be published in the form of a guidebook for tourists. This may be the local authorities' first attempt to explore market opportunities. It would have been simpler if we had a developed market. On the other hand, birdwatching is not a spontaneous kind of recreation; we have been working to promote it. Until recently, birdwatching was limited to protected areas, and we only talked about birdwatching in these areas and did not hold large public discussions. We now have the possibilities to offer birdwatching anywhere, but will this type of tourism be promoted in these areas? Do nature protection organizations need this? There is interest in birdwatching in our region, and we will work to promote it. What is the difference between birdwatching and birding? Birdwatching and birding are basically synonymous in Russian, but in English, there is a subtle distinction between them. Birdwatching is a form of leisure or tourism that involves watching birds, while birding is the process of watching birds. There is almost no difference in Russian. How should aspiring birdwatchers prepare? What equipment do they need? I would recommend going on your first birdwatching session with people who have more experience. People often think that watching birds is very simple. It takes years to accumulate experience, and seeing a rare bird is a combination of skill, experience, reaction, knowledge and much more. Before going on a birdwatching session, you need to learn about birds somewhere else. There are special literature and bird handbooks in Europe. Although birdwatching is rapidly developing in Russia, there are few opportunities, and I can't name a good bird handbook. But there are special books and equipment, not to mention the internet. For birdwatching to be interesting, you should at least learn about different kinds of birds, where they live and when you can see them. A birdwatching session in any area is a small expedition for a beginner. As for equipment, the most important thing is optics, different kinds of optics for different purposes. If you want to watch birds of prey or seabirds, you need powerful optics, and the best option is a spyglass. If you are watching forest birds, you need small and medium binoculars that are compact and convenient for seeing a bird in flight. The same goes for cameras. You don't need a super-powerful camera where its possibilities cannot be utilized in full. Equipment varies from one environment to another. There is a big difference between the tundra and the taiga. All you need is an experienced mentor nearby, a bird handbook, optics, a survival kit if necessary and a GPS if possible, because sometimes you want to return to where you have been before. Birds are dynamic creatures, which is often a problem. I would recommend for those who are interested in ornithology to test their birdwatching desire in a simple environment. It can be an urban area or some place with water bodies. A forest is a mode complicated environment. If you become convinced that this is what you want, you can expand your potential across the country. Are drones used to watch birds? Is this permitted? As far as I know, there are restrictions on the use of unmanned aerial vehicles, but I'm not sure. 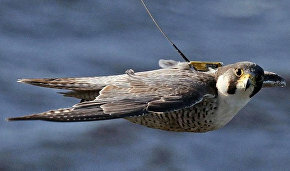 I wouldn't recommend using drones in certain cases, especially if you are watching rare birds. They can become frightened, which is a critical factor during the breeding season. Drones can be used to make a film, but birdwatching is a process of connecting with nature. I don't think it would be good to replace it with modern gadgets. Is it possible to work on such projects as yours as a volunteer? We have different kinds of tasks in which different specialists can be involved. There are many professionals with specialized training in Moscow who can go on an expedition to help collect field data. We are thinking of using their services on a regular basis. We certainly need people who can see and observe birds, skills that take time to develop. We need such people for our project. We have several of them on the team: birdwatchers who have accumulated a certain amount of knowledge and can be useful.